Vancouver is often overlooked in Canada in favor of the country’s largest city (Toronto) and the culture of the East (Montreal). 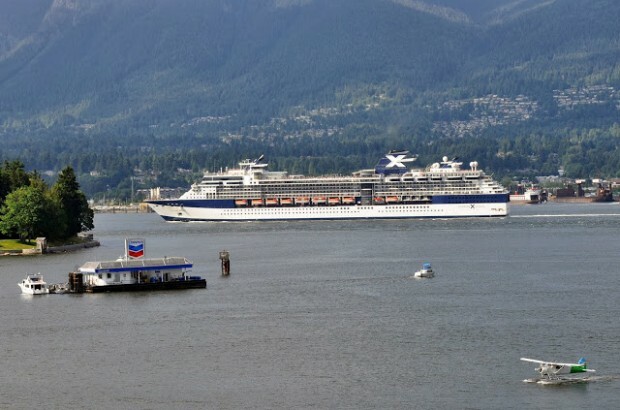 But to travel to Canada and overlook Vancouver would be a huge mistake. I first visited Vancouver in 1986 for the International Exposition (Expo) and the city has changed remarkably since then. A recent work trip brought me to British Columbia and I decided to extend my time in Vancouver to explore this friendly city. The quality of a city can often by judged by the quality of its urban parks. 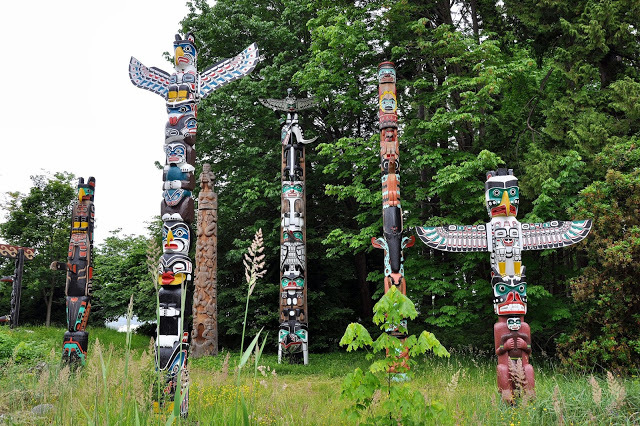 By this yardstick, Vancouver is one of the top cities in the world thanks to Stanley Park. This 1,000+ acre park offers beautiful views of the Vancouver skyline and the floating gas station in the harbor (something I was enthralled with on my trip). Stanley Park traces its roots back to the city’s founding and unlike nearly every other urban park in the world, it’s natural. The park wasn’t created by a landscape architect and hasn’t been “sculpted.” In the park, the giant Sequoia trees are not to be missed because of their tremendous size. This park is one of the few places where they remain protected. 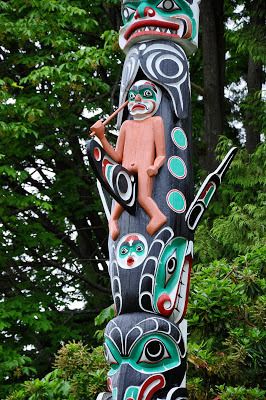 I also particularly enjoyed the Inuit totem carvings because of its representation of the First Nation people who have always lived in this area. 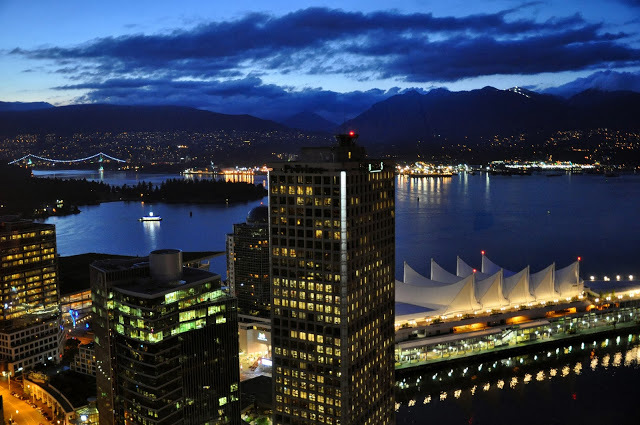 Since 1977, visitors to Vancouver have come to this building for its breathtaking views of the Vancouver skyline, harbor and mountains. Atop the 594-foot high tower, information panels explain the names and history of various sights in the city. I visited during the day and then returned again at dusk to take pictures. The views at night are stunning! 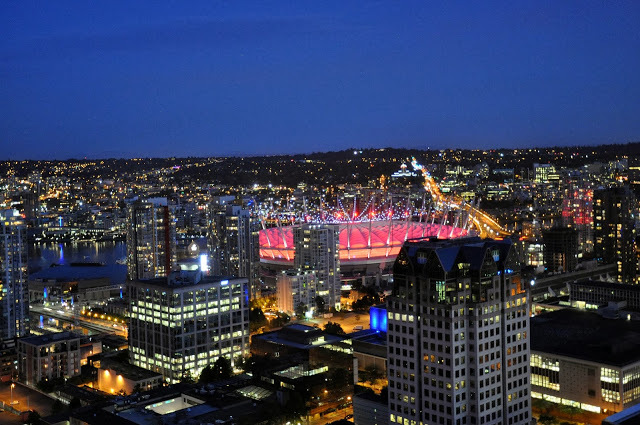 One of Vancouver’s finest hours was hosting the 2010 Winter Olympic Games. The Olympic flame burned brightly in the crisp Canadian air for several weeks. 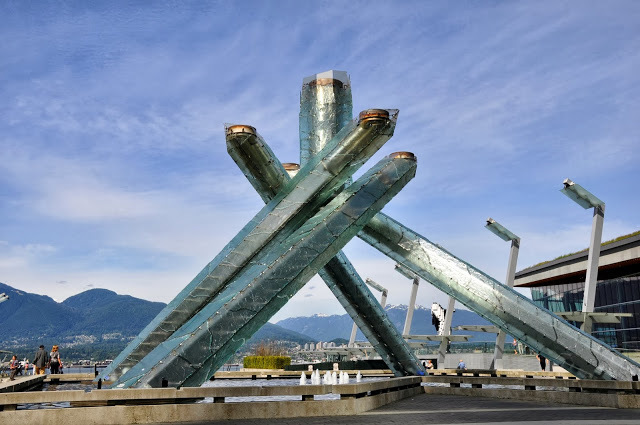 The flame has been extinguished, but visitors can still see the Cauldron, which is situated in the beautiful Jack Poole Plaza at the Vancouver Convention Center. The mountains and the harbor provide an iconic backdrop to crystal shaped Cauldron. I found this was a great place to enjoy my morning coffee. The Vancouver Aquarium Marine Science Centre is located in Stanley Park and is one of the most popular attractions in the city. 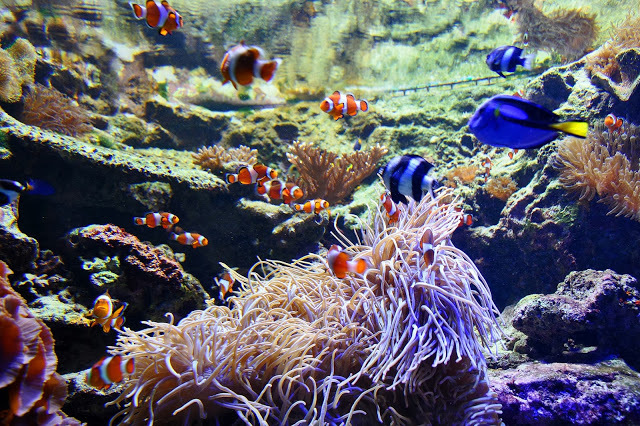 You’d expect a city on the ocean to have a world class aquarium – and you’d be right. With over 70,000 animals from 6,000 different species, the aquarium is packed with things to see and do. 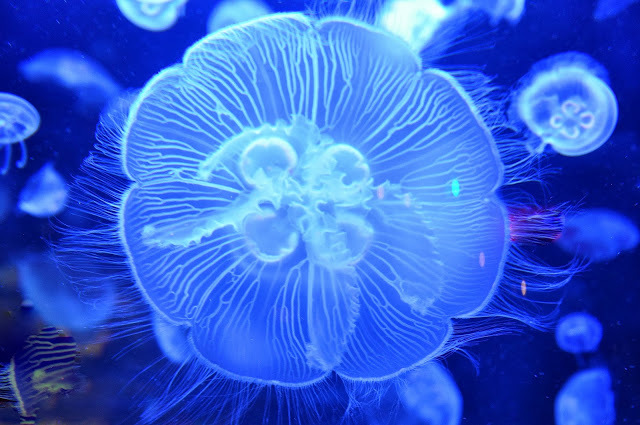 I’m a sucker for jellyfish, and the aquarium has numerous tanks devoted to the surreal little creatures. If you think about Vancouver’s location on the pacific coast, it would make sense that the aquarium is pretty awesome. I’m a sucker for aquatic marine life (hence my love of snorkeling and scuba diving). What I really wanted to do during my visit was go and see the orcas on a Vancouver whale watching tour. Sadly, I wasn’t there in the right season, so needed to settle with the aquarium visit. The Gastown District of Vancouver was the city’s original harbor-side downtown and was filled with saloons and general supply stores. 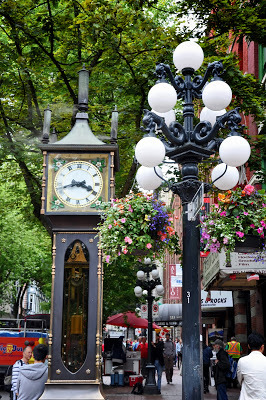 Gastown is famous for its steam-powered clock. The clock is modern, but designed to look antique. Today, Gastown is a hip urban center with restaurants, shops and nightclubs. During my trip, I saw several bachelorette parties moving from bar to bar. There is no doubt about it – Gastown is where Vancouver goes to party. I ended up in the Gastown District several nights for dinner, drawn by the variety and quality of the local restaurants. Vancouver has some of the best street art murals I’ve ever seen. 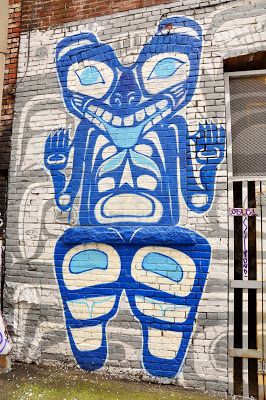 In the alleys off Cordova Street and throughout the city, the murals are laid out on one-hour walking tour routes. If you tire of the more traditional sights, consider taking an hour and adding in a tour of Vancouver’s murals. What do you think about Six Vancouver Sights Not to Miss? 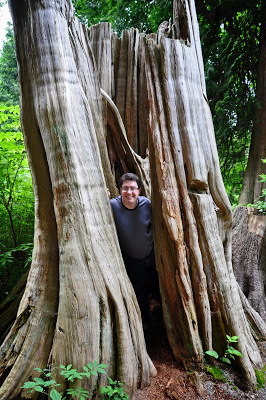 I love Stanley Park. I could spend hours just walking around. We were there in early June and the weather was perfect! Couldn’t have asked for a better time. We are from Vancouver – very much enjoyed reading your tips for this beautiful city!